“The science experiment is over. 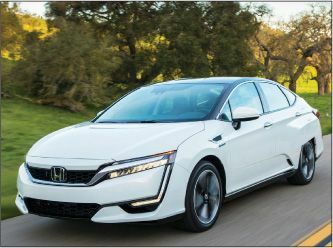 Hydrogen fuel cars are real.” Honda’s new zero- emissions sedan is far from the first hydrogen-powered car, but it is the first that manages to fit its fuel cell and electric motor under the hood, making the Clarity a legitimate five-seater. For now, it’s only available in California, and only on a lease set at $369 a month before tax credits and $15,000 in free fuel. An electric-powered Clarity will be rolled out later this year, followed by a plug-in hybrid. “Smooth and confident on the road,” the Clarity “has the feel of an Acura, a car from Honda’s luxury line.” But “a painful surprise” may await anyone counting on the Clarity to go 366 miles on a tank, as the EPA promises. During our test, we finished with 286 miles on the odometer and only five miles’ worth of fuel left. That’s not terrible range— it’d beat a Tesla—but hydrogen filling stations are scarce for now, even in California.